Bel O Kan is a very young symphonic power metal band from the Rhône region of eastern France. Originally founded in 2001 by Lionel Pedrini (drums), Eric Jasserand (guitar), Cyril (bass) and Ricardo( guitar), the band lasted only a few months before splitting apart. Renewed interest in 2002 sparked a reunification, this time with Maryline Welsch behind the mic and Chrÿs Ferrari as a second guitarist. Cyril eventually left to focus on jazz, and was replaced by Denis Nicolo. With the eventual addition of Stéphane Soulier on keyboards, Bel O Kan was complete. Ant Symphonia is the band's first recording, and the production is absolutely horrid. As harsh as that statement may seem, it cannot be closer to the truth. The task, therefore, is to reach beyond the surface imperfections and listen closely to what the band is trying to do with their music. The vocals are, of course, always a potential pitfall for many young metal bands. Maryline's voice has a certain enchanting quality, but she strikes me as being very hesitant in her delivery and thus sounds quite restrained. Were she to coax a little more emotion from her singing, I think she would excel behind the mic. We may never know, however, since she has decided to step away from the band and has been replaced by the raven-haired Kleim Antyne. I've not heard any clips featuring Bel O Kan's new femme fatale, so the jury will have to remain out regarding the impact she will have on the band. While Maryline dominates the vocals on the album, drummer Lionel does add an occasional spoken-word passage (with an overuse of reverb). I find the music more impressionable without him. Musically, Bel O Kan relies heavily on the keyboards of Stéphane Soulier to create their symphonic sound. His work is the strength of the band, as he graces each track with varying degrees of orchestral imitation and just the right amount of background. Be it flute, harp, or harpsichord, his elements are effective and well placed. The guitars suffer most from the production, often sounding muted or tinny. There are times where the riffs blend perfectly with Lionel's skinwork to create some serious headbanging moments, but for the most part the songs are slow to mid paced and only the solos garner attention. 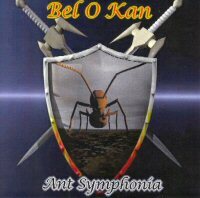 Bel O Kan is a band striving to establish their sound and identity, with Ant Symphonia being just their first attempt. I certainly could have lowered my score by at least half a star, but in all fairness these musicians show promise and the potential to contribute to the European power metal genre. For these reasons I look past the blemishes of this demo and await with interest the new songs that the band is currently working on.